Please provide us with the details of your videocard driver version. It's one of the latest Guillemot Hercules RADEON 8500 chip cards with DirectX 8.1 which gave them and me days of work getting satisfactory results using it with both FS2002 Pro and MSTS. Excellent 800x600 FRAME RATES with both now ! Disabling DirectX-3D in TRAINZ Settings finally got it to Load. But one of the improvements with SR.3 is that it is supposed to be fully compatible with the latest 3D Cards and DirectX 8.1 ? Simware.com could not tell me what the TRAINZ Version is they supplied a couple of days ago, nothing on the Box nor inside to indicate the Version. The whole issue is irrelevant now because having had a look at it, comparing the Quality of it's Tracks and Switches / Points with MSTS, I have decided to Un-Install it. There are many other aspects I dislike, the necessity to constantly having to use a Mouse for Basic Camera Control, Screen Overlays which can not be cleared from it and should be totally hideable as in MSTS and the Menu Bar in FS2002. REDUCING the Driver Window drops it into the bottom right of the screen, hiding the INCREASE Window Icon, forcing a re-start to enlarge it again. Can not be DRAGGED back into the Center of the Screen ? After the release of the next version of MSTS it is hoped that HARDWARE CONTROLLERS, to function similar compared with REAL TRAIN CONTROLS, will be made available by Manufacturers. I am aware of one USA Corporation having a number on their Drawing Board already. This will require TrainSim Software to OUTPUT Key Function Codes suitable for use by HARDWARE CONTROLLERS. Keeping this in mind, it would be a good idea to STANDARDIZE BASIC CONTROLLER Key Codes, to avoid having to re-program such Controllers for each Train Sim individually, as is the case with many Flight Sims at present. Looking forward to Improvements along these lines from the MAJOR TS-SIM DEVELOPERS !!! which means Auran DO NOT have to support you since you don not have minimum requirments, and they are still trying to help you. And you already started MSTS comparing...WHY? Dont you people get it its a different game with different goal? This is copy and paste from Chat between comunity and Trainz team back on AMrch 5th 2001, even before MSTS was released. Greg Lane is the CEO. <Rachael_Nixon> <Barney> I personally do not see Trainz and MSTS as competitors but as complementing each other. Any thoughts on that? After this post I will reply to each of your disliked points. Yes, thats what they reall need to know. >and MSTS. Excellent 800x600 FRAME RATES with both now ! So? You did not answer what drivers version you have. There is no such s thing as SR3. Many ATI 8500 users get better results on Open GL. >inside to indicate the Version. Version included should be 1.1.1 if it was in the box below. >Points with MSTS, I have decided to Un-Install it. Switches? Thats all you compare to MSTS without looking at other aspects? Buuuu you can use 1, 2 ,3 arroes and Page Up and Page Down to chage views. >be totally hideable as in MSTS and the Menu Bar in FS2002. Buuuuu you can press Ctrl+Space and everything will go away excep one little red dot on left top ofthe scereen just like below. >the Center of the Screen ? I dont get what you mean, please explain more. Do you mean runnig it at kind a windowed mode inside the train? If so that doesnt happen to me and I believe most of us. >number on their Drawing Board already. >with many Flight Sims at present. We plan to support third party controllers such as those from Kato(R). These controllers allow the use of in game controls similar to those on real trains. Now functions like the throttle and brake can be assigned to real handles giving you a much greater feel for their operation (This option requires an additional 'Controller to PS2 converter' available separately)." I dont really what you want improved. I dont get your point at all. eventhough you can do it but you didnt know because you didnt read the manual. Question to you. Do switches in MSTS move by wind or what? I thought automatic switches needed something like this? The obvious conclusion would be then, what you're running is not Trainz SP3 but earlier version. The external camera can be controlled with cursor keys. Page Up and Page down control zooming in and out, respectively. As mentioned by someone else, you can switch the overlays off/on with Ctrl+Space. It [em]could[/em], but since there's no longer option to reduce Driver window in SP3, this confirms my initial impression you're not running Trainz SP3, but some earlier version. Have not replied sooner to give everybody a chance to come up with some answers so that I can respond to your comments. VERSION. I have been sold the Euro Retail Pack 1.1.1 by SIMWARE.COM, although I specifically asked them whether it was the SP.3 Version. ArxelTribe, the European Agents for AURAN, inform me that there is no SP.3 for Europe as yet, SIMWARE.COM being Distributors must have been aware of, not telling me. I also do not remember words to that effect on the AURAN-TRAINZ site ! 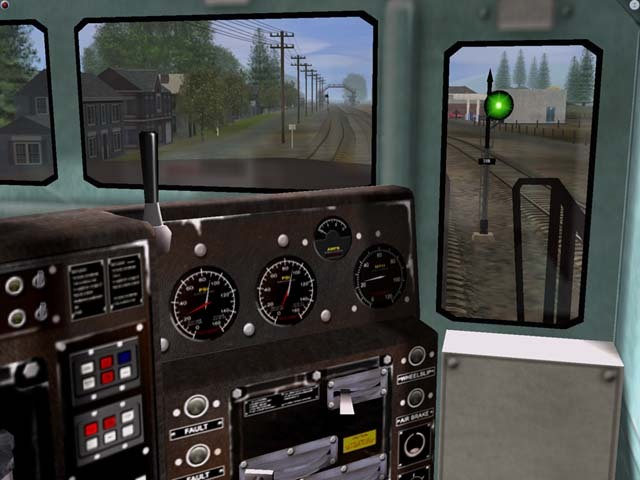 TRAINZ SCREENS. I do not like my SIM Screens obscured by anything. If some ON-SCREEN Help is provided, there should be an option to remove it, ALL OF IT ! Despite all Display Settings at MAX and CLEAR, what is all this Haze in the background, obscuring this USA Scenery ? And look at the carriages ! TRACKS & SWITCHES / POINTS. To me, Model Railroading and Train Sims are foremost about Tracks ! There is no comparison between MSTS, in particular Okrasa's XTracks and this lot. The Switches Blades don't move and there are no visible gaps in the switches "Frogs", as we call them here in the U.K. You can not tell looking at one which way the Train is going to go ! REDUCING the TRAINZ WINDOW. Clicking on the Icon in the top right hand corner of the Help Overlay to Reduce the Window, this is what happens. The Icon disappears and the Window can not be restored to FULL SCREEN again. GRAPHICS CARDS. My Guillemot RADEON 8500 is the latest out of their stable, on a par with the GeForce T4...s, using DirectX 8.1. It is not a question of what "Driver" I am using, they wouldn't know what I am talking about even if I told them, being the very latest from Guillemot they should be aware of. Their latest SP.3 release is alleged to be DirectX 8.1 - 3D compatible. I can't tell, I can't get it ! AURAN-TRAINZ having been told who sold me TRAINZ and knowing where I live, should have told me the facts. Here in the U.K. if you advertise something which is not true then you are in trouble with the "TRADING STANDARDS AUTHORITY" and a lot of others. I am a Freelance Journalist and Reviewer in the Simming Media world-wide and shall wait until my return from a forthcoming visit to the States, hoping to buy a SP.3 Version of TRAINZ over there, before passing a Final Opinion. How many times are you going to repeat yourself damn it. Well, I'll repeat myslef too then. >up with some answers so that I can respond to your comments. >effect on the AURAN-TRAINZ site ! There is only 1.1.1 out there. Did microsoft release new packege of MSTS after the upadates? No. This is same thing. >should be an option to remove it, ALL OF IT ! Use SCTRL+SPACE. How many times do I have to say it? >this Haze in the background, obscuring this USA Scenery ? >And look at the carriages ! >Train is going to go ! Again i dont think its big deal comparing to what other things you can do. >Window can not be restored to FULL SCREEN again. I tohught you know how to use windows at least. You can drag it with transparent brown part. Note that this has been disabled in SP3. You cant do it anymore. >3D compatible. I can't tell, I can't get it ! Who the heck is Guillemot? There are HUNDREDS of video card makers. YOU are the one who should know what drivers you are using. How are the gonna know? Hack into your computer? AND on top of that you dont even have SP3. >where I live, should have told me the facts. You should have researched it. >AUTHORITY" and a lot of others. To bad. Everyting said is included in Trainz. YOU ARE REVIEWER?!?!?!?!!?!?!?! OMG. You dont even know abotu your computer and you are reviewing games. You DO NOT NEED to buy SP3 version. Just download it. If you have slow connection you can order Free CD. You only pay the shipping. I for one dont think so. I enjoy playing both games in differnt times and moods. Well, here's what it looks like for me. Traiz tracks are all made of splines, which means you don't get very detailed switches and such likes. (they can be modeled, though) This disadvantage is imo balanced with ability to model completely custom track in less than 5 minutes while with msTS, you have to remodel all those numerous track pieces. SP3 can be downloaded from Auran's site, or ordered there to be delivered to you on cd. Sorry guys, but you did not notice the MAIN POINT of my post which is that there is No SP.3 UPGRADE for the European Version of TRAINZ I have been sold a couple of days ago. SR 1.1.2, some *.ja stuff, is all there is for the European Retail Pack 1.1.1 I have. AURAN can not say when there will be one. At the moment we are talking about 2 different versions of TRAINZ, yours obviously being a lot better than the one I am looking at. I wonder why they created 2 different versions in the first place ? O.K., the USA Gaming Mass Market is more important ? But isn't it more work having to work on two separate versions ? Ahhh, No, they did not create two different version. Now, abotu the SP3, yes, you are right. I did not notice that you have Europe Verison which means yo ucannot use the SP3 for english only. They should release other languages' SP3s soon tohugh. So, here what it is. There is only one version of retail Trainz, and SP3 is update for that version. but when you apply it, 1.1.1 to 1.3 and 1.0 to 1.3 becomes exactyl same thing. Another example, if you got 1.0 and updated it to 1.1.1 with the patch, you get EAXACTLY same version as retail 1.1.1. So, again, there is only one version of trainz. The difference is if its updated or not.